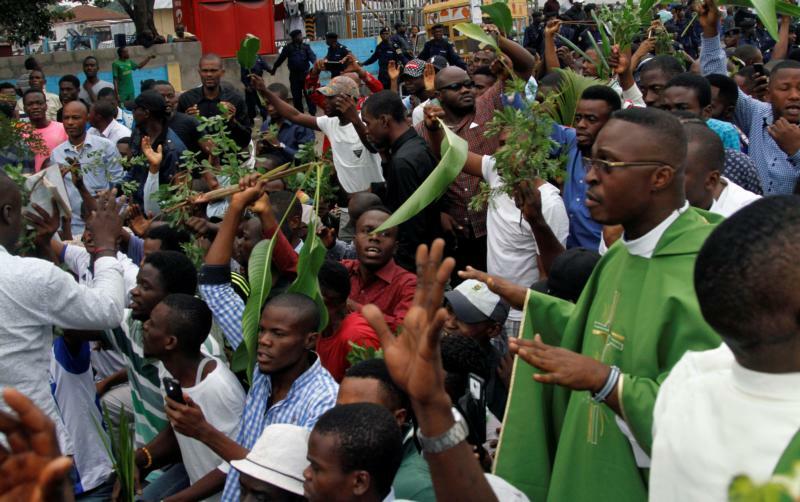 KINSHASA, Congo (CNS) — Congo’s bishops condemned the “excessive and disproportionate use of force” by security forces that dispersed protesters demanding President Joseph Kabila hold fresh elections in line with a church-brokered accord. In a Jan. 22 report, the bishops’ conference said “peaceful marches” had been “violently repressed and smothered with tear gas and bursts of fire” in 95 Catholic parishes, leaving six dead and 127 injured, some by police bullets. “Once again, the church deplores the excessive and disproportionate use of force against demonstrators with nothing in their hands but Bibles, rosaries and palms,” the bishops said. On Jan. 24, Pope Francis spoke of Congo at the end of his general audience in St. Peter’s Square. In a “technical note” Jan. 22, the Vatican Embassy in Kinshasa said security forces had surrounded parishes, used tear gas and “shots with real bullets” in Kisangani, Goma, Bukavu, Lubumbashi and Mbuji-Mayi. It added that two Congolese police had been killed by stray bullets in Kinshasa, and said “at least one priest” had been wounded and “at least three others” arrested in the capital. A spokesman for the U.N. Stabilization Mission confirmed the organization had recorded six deaths and dozens of injuries in Kinshasa when demonstrations were staged after Masses Jan. 21. The church’s lay coordinating committee organized the demonstrations. Agence France-Presse reported a 24-year-old female religious novice had been killed when police fired on St. Francis de Sales Church in the capital’s Kintambo suburb. It added that similar violence had erupted outside Notre Dame Cathedral and in many of the city’s 160 Catholic parishes, as protesters, accompanied by clergy, waved crucifixes and rosaries.